Get Lured, Hooked, and Reeled In! Fishing Star World Tour, by developer WFS, and originally a mobile game, swam onto the Switch this January as an action sports title where catching fish and unlocking new equipment to use is the main ‘hook’ in the game. The game starts you off with the standard low-level equipment in the easiest fishing spots, as you slowly progress through the levels by completing missions and catching specific fish in each fishing hole. Fishing Star World Tour has a lot packed into its colorful world, though the main game mechanic of casting your line, reeling in a fish will be repeated a lot throughout your journey to the various locations in the game. There isn’t a story in the game but you move from world to world in an airship. Once you choose your main location you can visit five of the various fishing spots within it. Each spot is home to three or more species of fish wish you must catch. Some locations will task you with finding two or more of the species of fish to progress through to the next location. Completionists will find a desire to catch all the fish within a location which in turn will unlock additional pieces of equipment like rods, reels, and lures which can help aid in the catching of rare and epic species of fish. Your tackle equipment plays a huge role in how you find fish within each location. Some lures will only attract certain species of fish. Reels and rods also add stat boost to your fishing capabilities by increasing the strength and durability of your line and the effect your lure has on fish that are attracted to it. 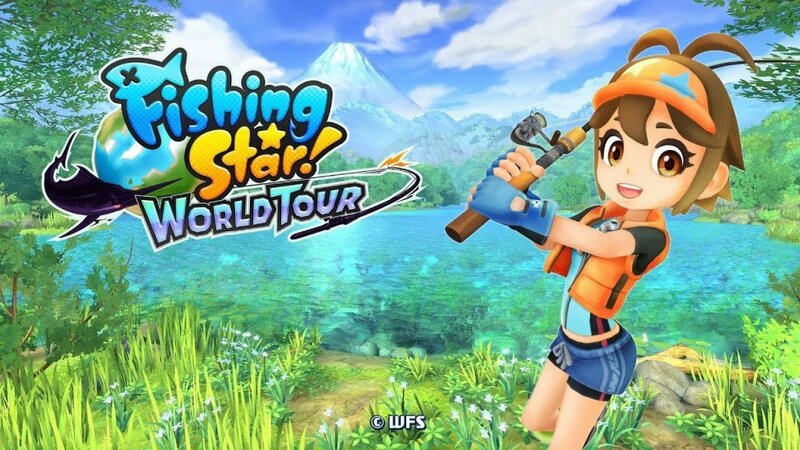 For a mostly arcade-like fishing experience, there is a good amount of RPG-like elements in Fishing Star World Tour, as well as slight Metroid-like revisiting of past fishing locations once you unlock certain tackle that lure previously inaccessible fish species. When you visit a new fishing spot you will need to equip one of the aforementioned pieces of tackle equipment, specifically a lure that will attract the type of fish species within the spot you are fishing from. When you first visit a spot you can see either a triangle, single orange circle, or two blue circles indicating if a fish is attracted to the lure you have equipped. You may need to switch your tackle a few different times in each fishing spot before you collect each type of fish from a certain area. Some fish may be unable to be caught at all until later in the game when you unlock a certain lure or rod which allows you to reach fish further away from the shore. Fishing Star World Tour includes three main ways to fish within the game. There are left and right handed options for you to fish with split Joy-Con, or you can fish in either handheld mode with the Joy-Con attached or by using a Pro Controller or Joy-Con in the cradle in docked or table-top mode. I tested each of the controller modes extensively and in my opinion, split Joy-Con is the best way to play Fishing Star World Tour. The simple motion of casting your rod with one Joy-Con and turning the other one as if reeling an actual fishing rod felt life-like to me. The Joy-Con also offers the added benefit of the HD Rumble feature which includes a slight ‘nibble’ sensation when the fish first bite the hook, and then a vibration that feels like tension you would imagine with hooking a real fish and the feeling your hand would have by reeling your catch. The way you approach catching a fish in Fishing Star World Tour is pretty simple. After you select your location and tackle equipment you can set your line by moving the target circle using the left joystick. You can zoom in using the right control stick to see if you are near an incoming fish as their silhouette shows up in the water. Once you have your spot you can flick your rod forward to cast your line. If you’re using split Joy-Con you are going to want to reset your rod in the upright position by pressing the ‘L Button’ before you cast your line. Just be sure not to reset your rod position while you are reeling in the fish or else your Joy-Con motion tracking will be off. Once you have hooked a fish, you will see a red exclamation mark over its head and you will want to pull back on the rod to set the hook inside its mouth. Once your fish is hooked you will need to juggle the main meter, which fluctuates from greenish/blue to red as you alternate between frantically reeling in your line and moving your rod left and right. While you are reeling in the fish you may need to stop reeling and point your rod towards or away from the fish depending on where the ghosted outline of your rod indicates you should move to. From time to time a mini-game of sorts appears during the time you are reeling in your fish. There are three rings in a bullseye-like target. The objective here is to land a ‘Perfect’ by pulling the fishing rod towards you when the fish swims into the center of the target. Getting a perfect will pull the fish out of water closer to shore, decreasing the distance you need to reel it in by several meters. Failing to land a perfect and either getting a good or ok spot will net you less distance recovered when you pull the fish out of the water. Once you catch your fish you are graded on the uniqueness of the species, either Normal, Rare, or Epic, along with a length and weight measurement. The catch screen also shows you your stats regarding which tools you’ve used, where you’ve caught fish and whether the fish is your First Catch, New Record, or neither. There are achievements in the game for catching every species of fish and four star fish, which requires that you fish each area using lures specific for catching the best fish of each type. Each main location has five fishing spots you can visit. The fifth spot is usually a unique ‘boss’ fish battle in which you must find an elusive epic fish monstrosity before unlocking the new world. The boss battles are a back and forth battle of reeling your line quickly while paying attention to the meter and also making an effort to land Perfects when the fish swims within the blue rings which pop up from time to time. The additional boss fish mechanic offers the most challenging of species which usually look like a mutated version of that area’s biggest type of fish. Boss fish are typically longer fights and the feeling of breaking your line when you are just a few meters from shore is a sour feeling I felt a few too many times during my playthrough. Fishing Star World Tour has a lot of content for completionists. All of the areas in the main game won’t take you long to get through, but the elusive rare and epic fish will keep you fishing a lot longer if you desire to unlock the games 70+ pieces of tackle and find the over 180 species of fish. Since each of the locations only requires you to find a certain species of fish once you may find the main game over and the desire to collect everything may not be for everyone. If you are a completionist and desire to unlock each of the achievements in the game you will need to sink a lot of time into Fishing Star World Tour. The Switch version of Fishing Star World Tour adds the added Labo Toy-Con Fishing Rod mini-game as a playable option as well. This mode, dubbed Toy-Con mini-game, is a simplistic approach to fishing much like the Toy-Con game within Labo. Using the same set up of Joy-Con in the rod and reel portion of the Toy-Con and placing the Switch upright in the holder you place the game on the floor and operate it by casting the rod forward and getting within the circle where the fish you need to catch is located. The fishing portion is similar to the main game but using the Labo fishing rod does add even more to the realism. It’s a shame that this mode supports the Labo rod and there wasn’t a way to play the full game using the Labo Toy-Con. It is to be noted that the fish you catch in the trolling mini-game are not added to your Fish Book within the main game. The visual of Fishing Star World Tour’s locations are aesthetically pleasing to the eyes even if they are very basic and limited. Since you are fishing from a set point on the shoreline or within a boat in some cases, and you are limited to one starting position, there isn’t much to look at in your roughly 180 degree landscape in front of you. You won’t be walking to each location or setting up in your favorite spot to fish from. That being said, the water effects and background locales are colorfully rendered and remind me a lot of the graphical style similar to the Pokémon: Let’s Go series. Fishing Star World Tour doesn’t have much in terms of game audio. There isn’t spoken dialogue in the game at all and the game music soundtrack is a bit repetitive featuring upbeat tunes that quickly overstay their welcome. The music becomes overly epic during a boss battle or epic fish encounter, but other than just increased tempo and slightly stressing me out during those battles, the music is rather passable. One thing I can’t overstate about Fishing Star World Tour is the amount of variety in terms of locations in the game, tackle equipment you will accrue, and more importantly the variety of ways you can play the game. Having both left and right-handed methods of controlling the rod and reel in split Joy-Con, as well as, the ability to play handheld or docked using a Pro Controller are all nice additions to the game. I was surprised by the amount of stuff to do and collect in Fishing Star World Tour. For a game that on the surface seemed very arcade-like and short in terms of actual gameplay, I was hooked (all puns intended) on Fishing Star World Tour from start to finish. The metroid-like revisiting of locations is a nice addition for those who want to complete all the games achievements and find the 180+ species of fish. While the game is geared towards younger kids, the challenge of catching the rare and epic species of fish may prove challenging for even the most seasoned fishermen.